This yoga-with-weights exercise is called Heaven and Earth because you reach to the sky and root to the earth at the same time. It stretches the side of your body and brings oxygen to your back and spine; it helps you warm up and focus on your breathing; and it gets the energy flowing through your body. Stand with your legs as far apart as your hips and your toes pointing straight ahead, and let the hand weights dangle at your sides with your palms facing inward. Inhaling to a count to four, extend the weight in your right hand forward and then above your right shoulder, following the weight with your eyes. Stretch out your arm and shoulder as much as possible without lifting your heels off the ground, and press your right foot into the ground as you look to the sky. You should finish inhaling as the weight reaches its peak. Feel your hip and the side of your body stretch as you lift the weight. If your neck feels too tight, look toward your elbow; in other words, look as high as you comfortably can. 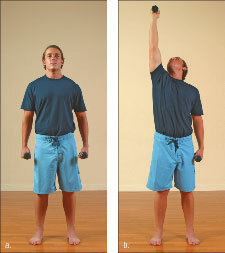 If your shoulders are tight, practice this exercise without a weight or raise the weight halfway. Exhaling to a count of four, lower the weight back to your side and return to the starting position. Keep your feet squarely on the floor throughout this exercise. Don’t throw the weight — gently lift it. Focus on your breathing so that you have smooth transitions as you inhale (when you lift the weight) and exhale (when you lower the weight). Try to time your breathing so that you never hold your breath. Your breathing helps you relax and do the stretching portion of this exercise. Repeat this exercise six to eight times with each arm, pause to rest, and then do six to eight more repetitions with each arm.